FOR IMMEDIATE RELEASE (June 5th, 2014, Santa Barbara, CA): Beginning today throughout the month of June, Eric Edson, author of The Story Solution is holding a contest for an opportunity to win a signed copy of *The Story Solution* by ‘LIKING’ the Story Solution Facebook Fan Page at https://www.facebook.com/ScreenwritingBook. Contest winner will be announced on July 2nd. Spoken of as “the best cure for writers’ block ever written,” Eric Edson offers an indispensable guide for new and experienced screenwriters to build powerful screen stories that will keep producers, agents and audiences glued to their chairs. Eric reveals the 23 actions used in every successful movie to create dynamic, three-dimensional heroes while linking together all parts of a captivating screenplay from first page to last. Writers looking to write the best screenplay of their career owe it to themselves to try innovative techniques contained in this remarkable screenwriting guide. To participate in the contest, simply visit and “LIKE” the Facebook fan page between now and June 30th. The winner will be announced on July 2nd. 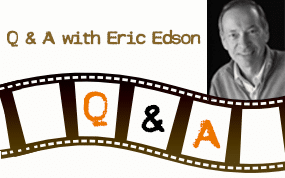 To preview some of Eric’s screenwriting tips, download a sample chapter; and to find out more about Eric Edson, one of Hollywood’s most accomplished screenplay writers, visit his website where you can read his bio and hear testimonials from other master screenwriters who champion his techniques. The Story Solution may also be purchased directly from the Michael Wiese Bookshop or Amazon.